Dilbert Mobile for Symbian^3 is an ultimate mobile application that has been praised by all the Dilbert fans. 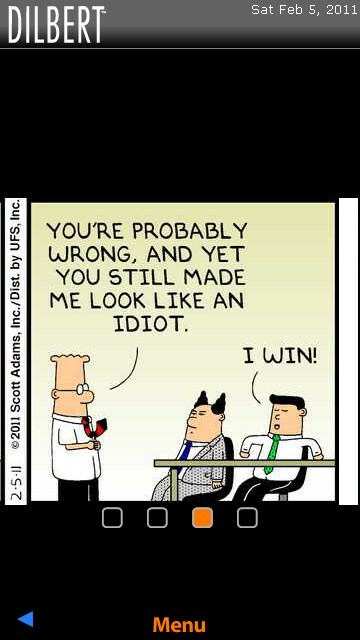 If you are new to Dilbert, here is a little history. 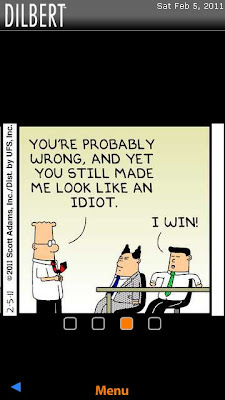 Dilbert happens to be an American Comic Strip and revolves around the office humor. 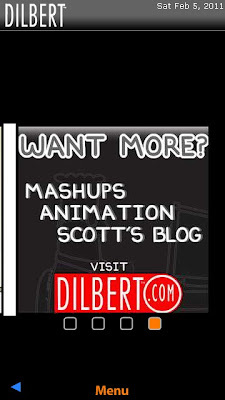 With this application you have access to the latest comic issue and the last 20 years of Dilbert's archive. The application is fairly simple to use. 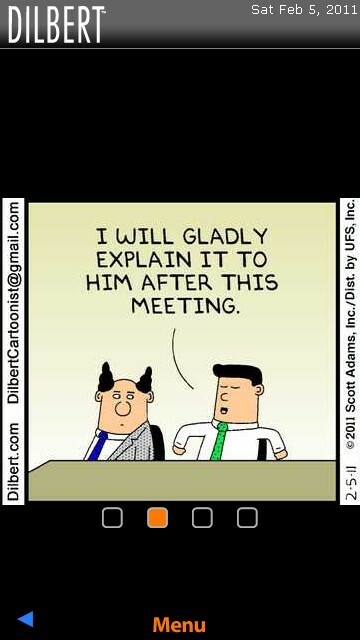 As soon as you launch the application, you need to accept the terms and you are good to go. 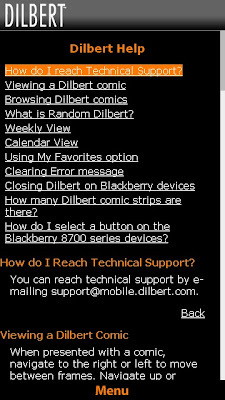 Dilbert Mobile requires a working data connection or a WiFi for download the comic strip on to your Symbian^3 mobile device. 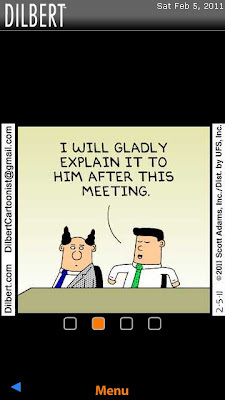 A single strip is generally a presentation of four boxes with drawings and text. Tapping the Menu option at the bottom of the application brings up the slider with option for random view, calendar view and weekly view. Using the calendar view you can go to the exact date of a particular comic strip. 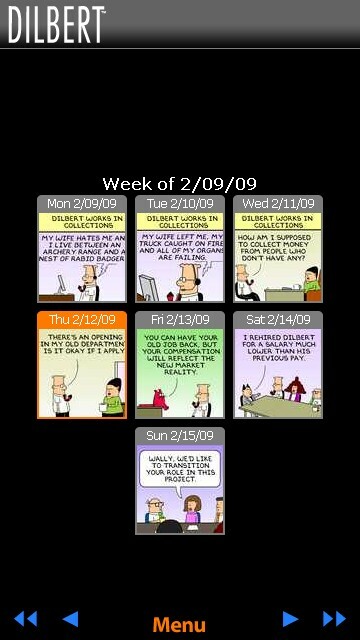 Say you wish to see the Dilbert issue on the 20th Feb 2009, simple navigate to that month on the calendar view and tap on the day. 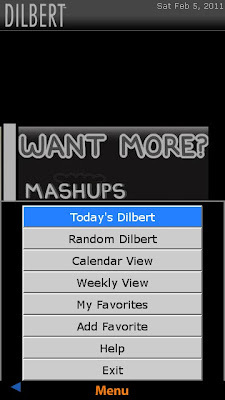 Further, you can also see the thumbnail view of the strip in the Weekly View option. The Random View option displays the comic strip issues randomly. 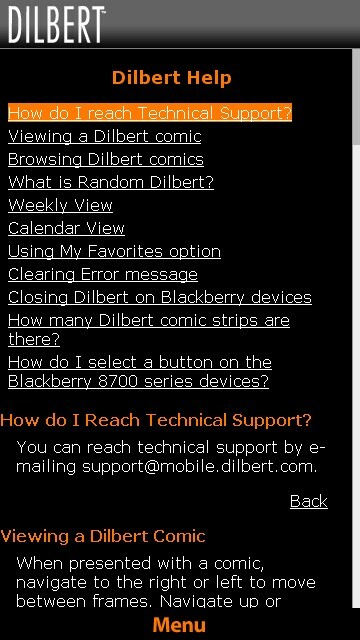 If you need help on using the application, there is a Help option in the Menu which is quite detailed. 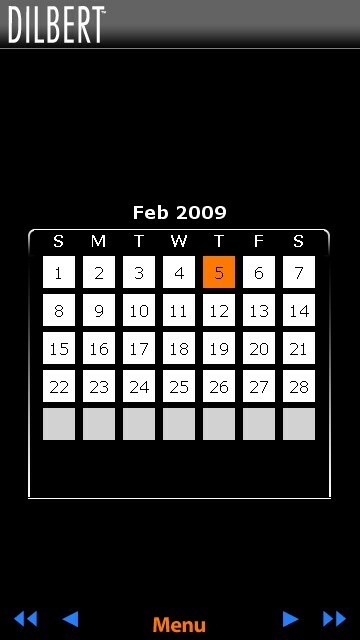 The data usage by the application is minimal and the overall design is good. 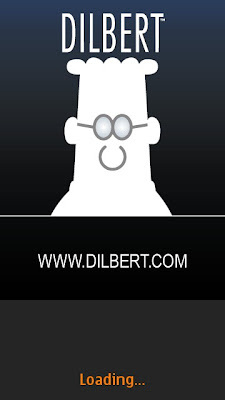 This is a must have application since it comes from the Dilbert's official publisher and also it is absolutely free of cost except for the data usage charges. 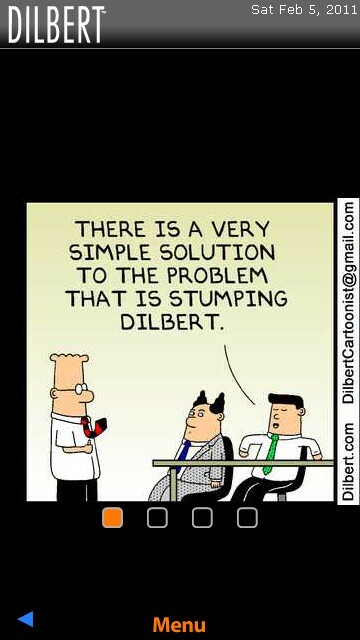 A great application for airports, railway stations and other places you are looking to kill time.